Scott and Kim Woods are the parents of Caleb Calvin Woods who was stillborn in December of 2011; the day before he was to be born. 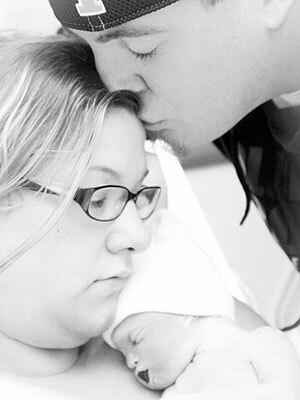 Caleb was our fourth pregnancy; we had lost our three previous pregnancies to early term miscarriage the year before he was conceived, and had dealt with the grief of those losses predominately alone. Because of the loss of our three previous children, we were very wary about getting our hopes up too high about our fourth pregnancy. Despite the glowing reports from our doctor each month regarding his development we spent the majority of it filled with fear and anxiety. We had always heard that once you make it out of the first trimester, it is incredibly rare for complications to occur and, while we breathed a sigh of relief once we moved out of our first trimester, we were still very nervous. We began to feel a little more comfortable each month, loving each doctor’s appointment, and each chance to see our growing boy and hear his strong heartbeat. Weeks and then months went by and our son grew stronger each day as did our desire to meet him. We got to know him over those nine months including his playful sense of humor and his dislike of all medical monitors. At the thirty six week mark, we met with our OBGYN, who determined that it was time for us to deliver Caleb by C Section. He asked us to schedule one last test for December 12th to check Caleb’s lung function and, if everything looked as good as he thought it would, Caleb would be born the next day on December 13th. That day we gave all of our remaining fears and concerns to God and delighted in the fact that we were going to have our son in our arms within a few days time. On December 12, 2011, we went to our final doctor’s appointment where the doctor delivered the heart-breaking, soul-shattering news that our beautiful son no longer had a heartbeat. 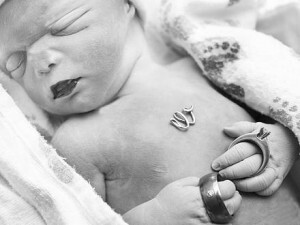 That afternoon at 4:59pm our son, Caleb Calvin Woods, was born silent as an angel to us. We spent four days in the hospital with Caleb; four days bonding with him and getting to know him. Four days being parents. We held him, read to him, introduced him to family and friends and took as many pictures as we could with him. At some point during our time in the hospital we were given a blue folder that contained little more than a list of funeral homes and mortuaries listed in it. With no guidance and very little information we were being asked to choose what eternal care options we wanted for our son. We had been planning a lifetime with Caleb and now we had to do the unimaginable- make plans after his death. How do you find a mortuary or a cemetery that will take care of your angel the way only you would? Do you get on yelp; what would you type into Google? How do you begin to plan a funeral for your baby when only a day earlier you were planning the rest of your life with him? It was during this overwhelming process that we decided that only grieving parents would understand how to help other grieving families through these difficult decisions. It was then that we came up with The Beautiful Scar Project. Caleb, along with his brother and sisters, are loved and missed every day and we are honored to be their parents. His life, as well as his death, has radically altered the course of our lives and has inspired us to ensure that no family grieving the loss of their baby is ever left without help or hope.